Acer's 23in Touch monitor is a good one to go for if you've got a Windows 8 PC or notebook that doesn't already have a touchscreen monitor. We like its image quality and the fact that it can be tilted until it's almost flat. Using Windows 8 without a touchscreen means you don’t get to experience the new operating system in the way that it was intended, primarily by swiping back and forth on the Start screen and tapping on icons to launch apps. If you’ve just bought a new PC or non-touch laptop and now you want to add touch capability, you can consider a monitor like the Acer T232HL. Acer’s T232HL is a 23in, Full HD (1920x1080-pixel), LED-backlit monitor that supports 10 multi-touch inputs and it has a relatively funky design that’s the same as what we saw on Acer’s Aspire U Series all-in-one PC. The front of the monitor features edge-to-edge glass that has been extended down seamlessly to create part of the stand for the monitor. Rather than make the screen look like it's floating (as it was meant to look like on the all-in-one PC), the clear glass on this monitor is tinted and gives off more of a grey look than see-through look. 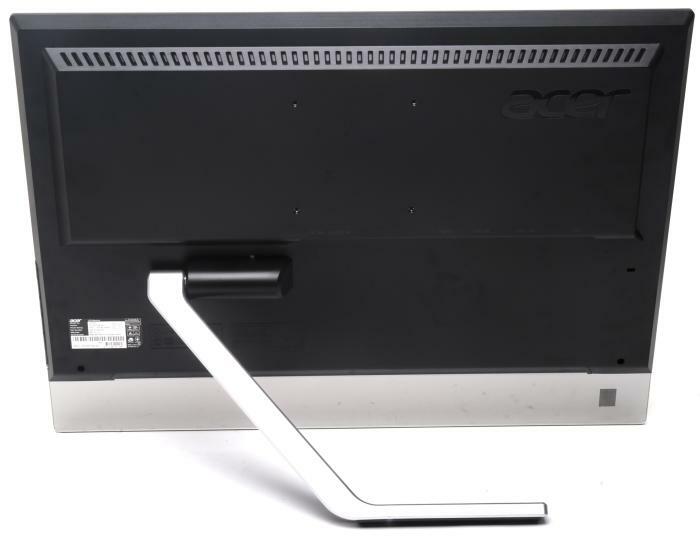 The rear of the monitor has a single, angled arm that allows the monitor to be tilted back and forth quite easily with one hand. It tilts down 60 degrees, which is a good angle for performing touch-based tasks. We typed up this part of the review using that screen position, but it did take us much longer than using a physical keyboard, and we were a little frustrated that we couldn’t make the Windows 8 on-screen keyboard bigger. Basically, it’s not a practical way to type; the lower angle is more suited for playing games with on-screen controls or for interacting with music, photo and video software. In fact, tilting the screen back and using your finger to swipe back and forth while leaning over the screen is a great way to view images on this monitor (as long as reflections don’t get in the way). We had no problems with the accuracy of the touch inputs. Our Windows 8 swipe-in gestures were recognised easily, as were taps and dragging operations of windows and files. The only thing that could be a problem is friction on the screen’s surface as you drag your finger across it. 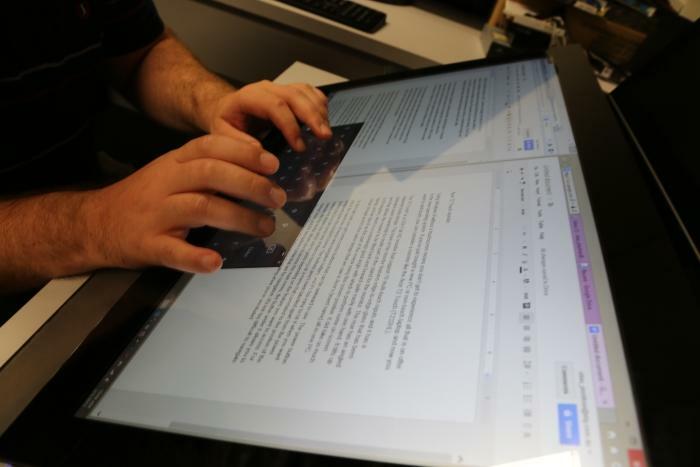 The screen tilts back almost flat so that you can type on it or lean over it to view photos and play games. The video inputs are located under the rear lip of the monitor and they include HDMI, DVI and VGA; there is also a 3.5mm audio input. As is the case with most monitors, these ports can be a little hard to get to; you’ll have to tilt the monitor forward a little so that you can see them, or just use your fingers to feel for the port that you’re after. There is a USB host port that needs to be connected to your PC in order for the touch functionality to work, and it also enables the three USB 3.0 ports that are located on the left side of the monitor. Stereo speakers are built in to the monitor, but they are only for very basic listening. If you want louder and better quality sound, you’ll still need to use a good pair of external speakers. The rear port cluster, which features HDMI, VGA, DVI and USB. On the right side you get some control buttons that can be awkward to use. The power button sits in the same line of menu and navigation buttons and it’s too easy to hit it when you want to try and enter the monitor’s menu. The buttons aren’t even labelled apart from the power button. However, you can press any of them to bring up a menu that correlates to the position of the buttons and then shows you which one to press depending on the feature that you want to access. For example, the top button allows you to access the main menu, the button under it allows you to change video input, and the two buttons below that are for navigation. It’s not too difficult to navigate once you get the hang of it, but it can be frustrating when you’re uninitiated. From the on-screen menu, you can change the brightness, contrast, colour temperature, and also select from one of Acer’s pre-defined colour profiles, including ‘eco’ mode, which reduces the brightness. We used the ‘standard’ setting for our tests and found the monitor to be perfectly fine for everyday tasks (viewing photos, watching videos, working on documents and playing games). Colours looked rich and pictures looked sharp. We noticed the screen's angles to be wide and we were able to view the screen from the sides, above and below without any colour shift or too much loss in detail. That’s a good thing considering the tilt angle that’s supported. The brightness is good enough so that the screen can be viewed comfortably in a well-lit room, but reflections might still be a nuisance in some environments. The rear arm allows the screen to be tilted very easily. The thin design of this monitor makes it look elegant and it keeps the unit light so that you can tilt it back to make proper use of its touch interface. It’s good monitor to choose if you are after something that will enable touch input on your Windows 8 PC or laptop and its image quality is very good to boot. It has a 5ms response time, which should make it okay for gaming — we had fun playing games such as Riptide GP from the Windows 8 store, which is a fast-paced racing game, and didn’t notice any ill motion effects. We’re only concerned about the reflections that come off the screen, which could get annoying depending on your environment, and we don’t like the control buttons, but the chances are that the controls won’t need to be played with very often, if at all. It comes with an external power brick that’s similar to a laptop’s power supply, and it has a rating of 64W.